The Lindbergs family - they appears at the farm Sten (Stone) in 1882 and leave for America 1892 - 93. Here you can see what have been published on www.facebook.com/Varnhemshistoria around Hemmanet Sten - just click on this link! The same picture in black and wite. Here you vagely also can see the farmhouse behind the cottage in the birchwood. The cottage of Sten today 07/26/2017! Only some cornerstones and the cimeny-pile remain in the grass under a huge birch. The local historien Arne Sträng and the Lindberg relative Nicole Fey stands on two corner stones in the west and the local historien Verna Andersson far back och Nicoles brother Jason stands on the other two stones. In the mittle Kent Friman is looking for some brick with sot on them for bringing to USA. 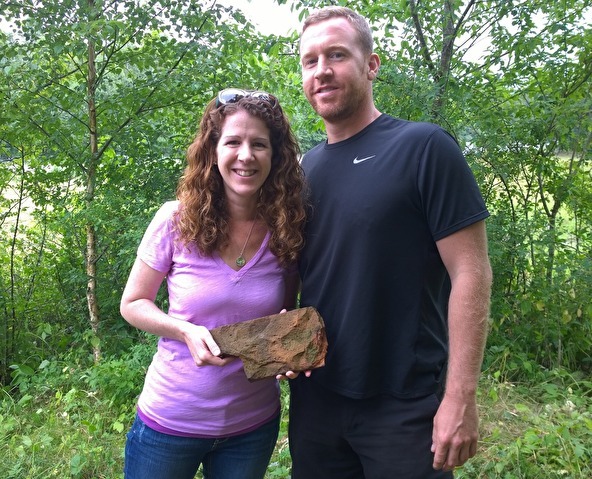 Happy sibblings with a brick from the old cottage fireplace! Gustaf Lindberg stands in the records for Sten as a ’worker’ - not farmer or ex drummer. His wife waited almost one and half year before she moved over to USA with her sons. Daughter Amanda Josefina Lindberg, born in Warnhem 4/4/1873 - moves to Björskagården Västerås Västmanlands län 1891 - died in Västerås Karlsdal 15, 8/28/1927. The cottage of Nr 330 with the last soldier and his wife 1905. 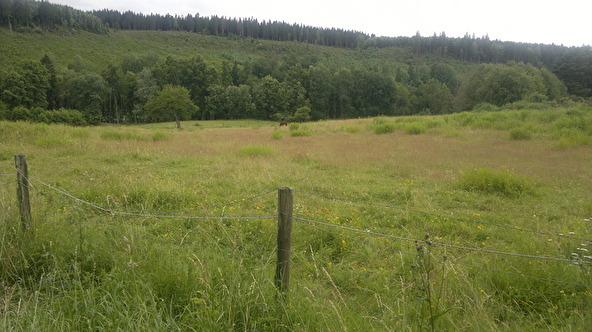 In the background you can see the farm of Sten. - he and his wife moved in to the Solders residence cottage Nr 330 in the year 1870 - he as a drummer for Military pupose - they lived here in 12 years to 1882, when they left for Sten. Here all there children was born. The size of the cottage was approximatly 5 meters x 8 meters = 40 m2, with one room, small hall and kitchen. 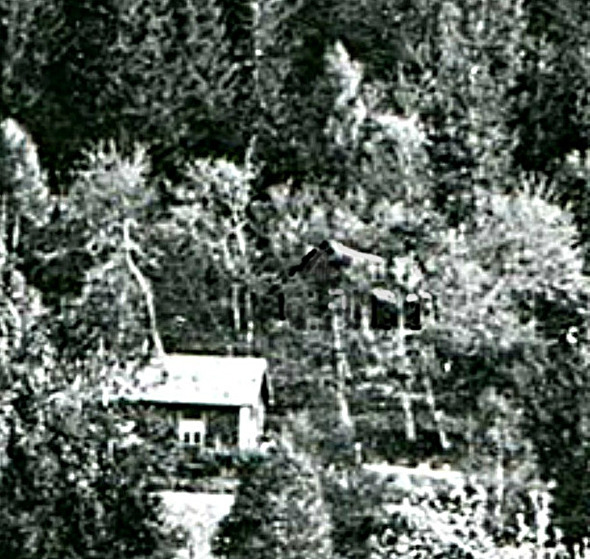 In the valley between the cottages on the photo 1905, runs a new road between Varnhem and Skövde built 1870. Before this they married and rent a place at the farm Björsgården in Varnhem during the year 1869. Probably they worked for the rent - he as farm-worker och she as a maid. Chatarina came as a maid from the big farm Hålltorp and Gustaf from his mother on the farm very near to Stenslund called Stenhammar and it’s poor cottage Stensbro. You can see the poor cottage of Stensbro (Stens bridge) just above the river to the right, a distance above Sten. It was a poor cottage to Stenhammar (Stone hammer). 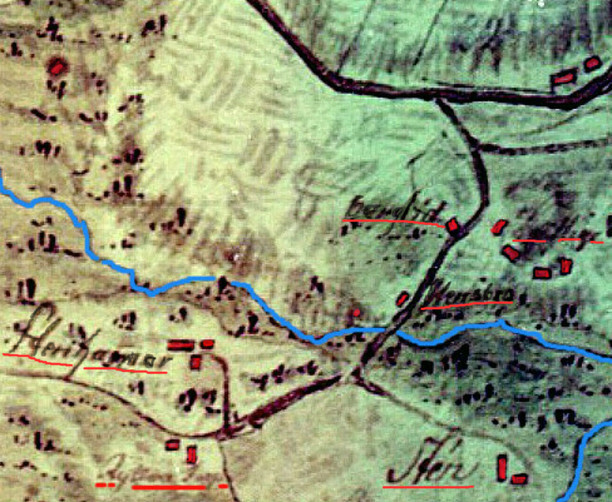 Stenhammar is the farm above 'Ryttare Torp' on the map. 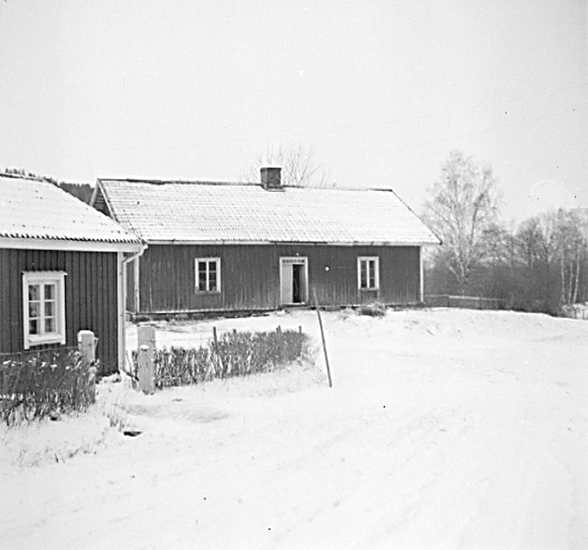 'Ryttare Torp' (Man-at-war Cottage) = Stenslund also close to Sten. At Stensbro Gustafs mother Anna arrived from a correction arrangement in Stockholm 1856, where she had to serve for her 3:d time in jail for theft! - Note; ”in jail for the third time for theft" -”married with former Soldier P. Qvist - he is a runaway"
Mutual son Lars Johan Pehrson Qvist, born in Skarke 06/24/1844 (1844-06-24) note; "musikant"
Housed Anna Larsdotter Qvist, b. in Ledsjö 1818, "married with former Soldier Per Qvist - he is a runaway"
Your ancestors are really people that have moved in a circle around this namne of Sten - Stenhammar/Stensbro near Stenslund. 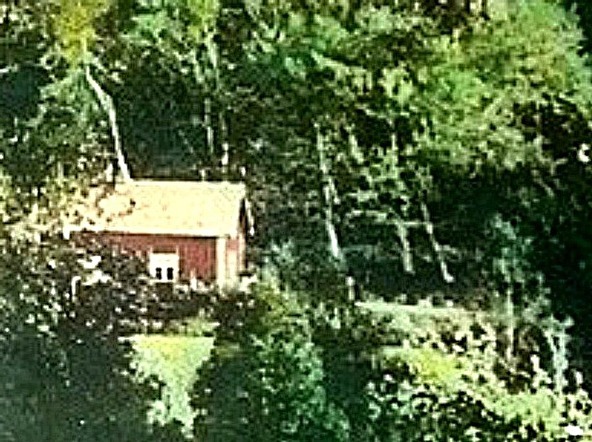 The poor house was removed 1958 and was used as a part in a nearby farmhouse. This parish poor house in Varnhem parish was bulit around 1860. So it was just 12 year before Anna and her two children moved in here 1872. It is situated only a step from Stensbro (and the other places where Gustaf comes to live). Gustaf left mother a copuple of year earlier to be married 1869 and manished to be a Drummer and could than move in to the Soldieer residence cottage Nr 330 1870. Click on the picture for bigger picture! Anna dies here 08/17/1904 (1904-08-17) as pauper. Anna Larsdotter Qvist had difficulties in raising her children without here run-away husband and former soldier P. Qvist. She had to survive by theft sometimes and that was rending her prison three times. The last time in a correction facility in Stockholm. Due to this she left her children in care of other people. Her son Lars Johannes Pehrsson Qvist, born in Varnhem 1844, was about three years old when he came to the family of Andersson in Kjellehagen. 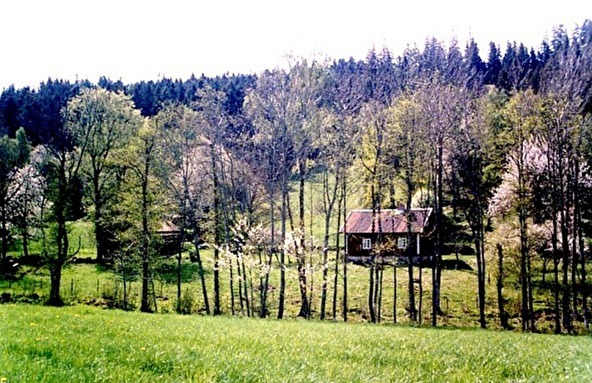 Kjellehagen was a small farm under the Vickers farm, Prästegården. Johannes Qvist leave Kjellehagen 1856 together with his brother to live with his mother some years in Stensbro and than he moved to Stockholm 1868. His brother August Pehrsson Qvist, born in Varnhem 1847, was in a foster home in Tåbohlet, an other small farm under The Vickers farm, Prästgården, between birth to 1856, when he left to live with his brother at his mothers place, Stensbro some years. 1858 they both moved in by the family of Andersson in Kjellhagen, the foster family of Johannes Pehrsson Qvist. Johannes left 1868 for Stockholm. Hut posser Eric Svensson, born in W. Klefva 02/21/1796 (1798-02-21) - Note; "of Gudhems district court doomed to church penance and six days i jail on water and bread"
We are still searching for their births in the church books! watched 2017-08-05 by 1 000 viers!